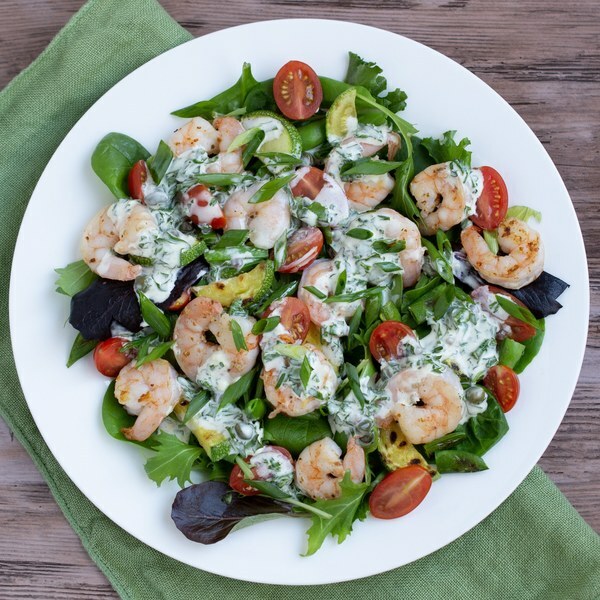 ← Warm Shrimp Salad with Lemon Caper Dressing. If using frozen shrimp, place them in a colander and run under cold water to thaw them slightly and remove any ice crystals. (If using fresh shrimp, skip this step.) Place the shrimp on a clean towel or paper towels and pat dry. Set aside. Juice the lemon into the small bowl. Shave leaves off the parsley stems; discard the stems, mince the leaves and add to the bowl. Finely chop the anchovy fillets, add to the bowl with lemon and parsley. Add mayo, capers, Dijon, and salt; whisk to combine dressing and set aside. Halve the grape tomatoes. Trim off and discard the root ends of the green onions; cut the onions crosswise into ¼-inch pieces at an angle and set aside. Halve the sugar snap peas at an angle. Trim off and discard the ends of the zucchinis; halve the zucchinis lengthwise, then cut the halves crosswise into ¼-inch-thick half-rounds. Once the skillet is hot, add coconut oil and swirl to coat the bottom. Add snap peas and zucchini to pan and season with salt. Cook, stirring occasionally, until golden brown, about 2-4 minutes. Once cooked remove veggies from skillet and place skillet back on heat. Add more oil to the skillet. Add shrimp in an even layer, add garlic and season with salt and pepper. Cook for 2 minutes each side until cooked through and slightly golden. Once cooked, set aside. To serve, place salad leaves on the plate, top with shrimp, tomatoes, and sauteed vegetables. Drizzle dressing over top and sprinkle with green onions. Serve warm and enjoy!